Pa Barrie is one of the best friends of Fr. Seraphim. 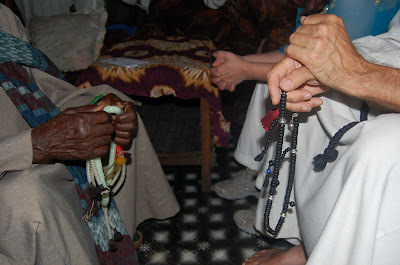 He is an extremely holy man He lives in Freetown but due to an illness had been in Guinea until he heard that Fr. Seraphim was in Freetown. Despite his illness, despite the terrible traveling conditions between the two countries, Pa Barrie hastened to Freetown to see Father Seraphim. The picture above captured the respect and love between these two religious men as they embraced upon seeing each other again after a long time. Pa Barrie is Muslim and prays without ceasing the Name of God for peace, love and unity. After meeting with Father Seraphim in Freetown, he returned to Guinea to gather his belongings to return permanently back in Sierra Leone. However, after arriving back in Guinea he became very ill and is unable to speak. His daughter left for Guinea this week, to see how best to help him and was very discouraged with the condition she found him in. He is gravely ill. Please, please keep him in your prayers!!!!!! James is making decisions as to what is best for Pa Barrie and what journeys should be made (Bringing his wife to him, etc. ) Keep all of this in your hearts and prayers.